Figure 62—3. 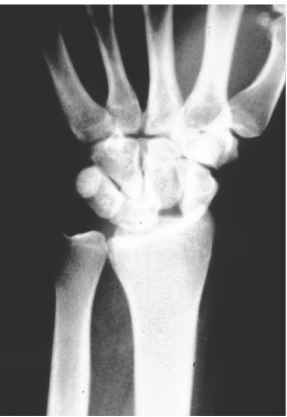 X-ray of triangular appearing lunate (normally appears trapezoidal) with overlap noted with the distal andproximal carpal row. Figure 62—5. Stages of a perilunate instability. Stage I involves a break or tear of the scapholunate ligament complex. Stage II interrupts the lunate capitate relationship with the force of the injury moving through the space ofPoirier. In a Stage IIIperilunate instability, the lunate-triquetial connection is lost and the carpus separates from the lunate. In Stage IV the lunate dislocates from its fossa often into the carpal tunnel and the capitate aligns with the radius. Figure 62—6. Perilunate dislocations demonstrating a pure ligamentus injury (left), or one with a "transscaphoidfracture" (right). dius and carpus. Due to this relationship, perilunate dislocations are more common than lunate dislocations. Perilunate dislocations are characterized by dorsal (usually) displacement of the capitate, which comes to rest on the posterior aspect of the lunate, causing the lunate to tilt volarly. The lunate maintains articulation with the distal radius in stage III. With lunate dislocations, in stage IV the capitate maintains its normal alignment with the distal radius, whereas the lunate is dislocated volarly. 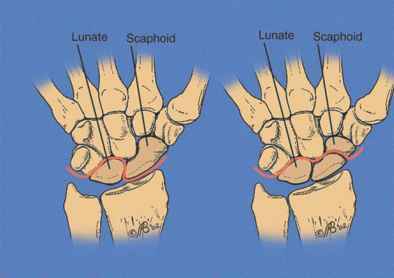 In the most severe injuries, the lunate may be dislocated into the carpal tunnel. The vast majority of perilunate dislocations are dorsal, and many have associated fractures. 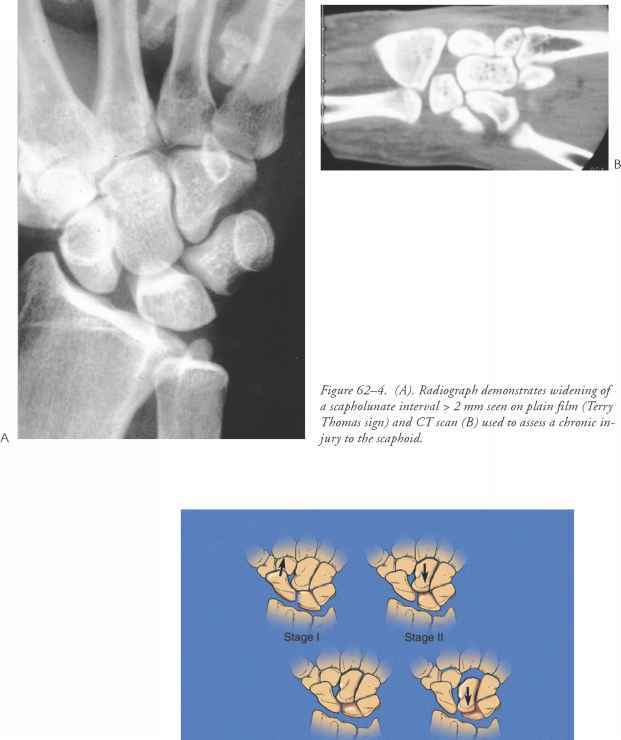 These include fractures of the scaphoid waist, radial styloid, capitate, and ulnar styloid (Fig. 62-6). 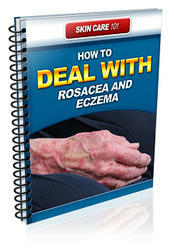 WHAT IS RESURFACING LUNATE CAPITATE?